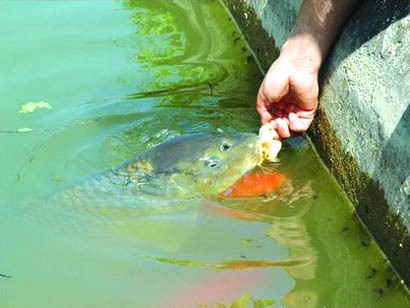 A Chinese man is looking for a good home for his pet carp which he says is fully trained. Fang Peng, from Pingsai town, Guizhou Province, claims ‘Submarine’ responds to his name being called out. There have been a number of — um — “unusual” stories coming out of China lately. He’s made a likeness of the Mona Lisa. There’s a portrait of Albert Einstein. He’s even recreated that infamous picture of dogs playing poker. You’ve seen knock-offs of those before. So what’s the big deal about Scott Wade’s art? It’s his canvas. 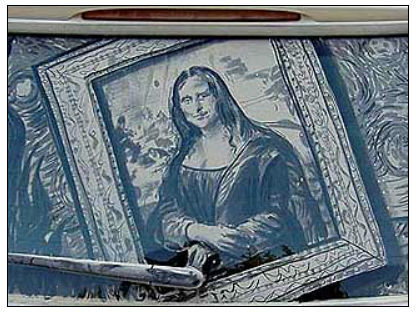 The San Marcos, Texas graphics interface designer paints his masterpieces in a place where they’re guaranteed not to last for posterity – the dirty windows on his Mini Cooper.